South Carolinians know there are some Christmas traditions that just can’t be broken, like going to a real live Christmas tree farm to find that perfect tree. Good thing there are plenty of Christmas tree farms that make it possible to carry on this family-favorite tradition. Each year hundreds of folks skip the long lines at the big box stores in favor of the thick, woodsy smell of an honest-to-goodness fir or spruce. If you’ve never had a real tree, or if you’ll never settle for a fake one, start your holidays with a trip to one of these 10 best Christmas tree farms in South Carolina. This family owned-and-operated Christmas tree farm is small and well off the beaten path, but the friendly family-focused service and high quality trees makes the trip worthwhile. You get the benefit of picking your own tree, and they’ll do all the work to cut it, shake it, net it, and help you load it. They offer a variety of live trees, as well as imported Fraser firs to give you exactly what you’re looking for. The folks here offer some of the “greenest” trees in the state. Yes, most trees are usually green, but since these trees are real, they’re far greener than any plastic tree you can buy at a store. They also feature one of the largest Christmas tree varieties around—Carolina sapphire, Murray Cypress,Thuja Green Giant, and the rare "Electra" Deodara Cedar, to name a slight few. If you’re looking for an authentic choose and cut experience, head to Penland Tree Farm. During the winter, they take a break from selling landscaping trees to offer “cut your own” Christmas trees, as well as a bonfire to help you warm up after your adventure. It’s also a favorite spot for kid-sized trees, too. Whether you prefer a pre-cut tree or like to do the hard work yourself, Booth’s probably has what you’re looking for. They offer a variety of cut your own trees, including Leyland cypress, Carolina sapphire, Clemson Greenspire, and white pine, in addition to freshly cut Frasier firs. There’s also a gift shop on site where you can pick up a few goodies to place on your new tree. There’s so much more than Christmas trees here. A trip to Lebanon Christmas Tree Farm is a chance to make holiday magic and memories for life. Saw your own tree, or ask one of the friendly staff to lend a hand at no extra charge. They also feature a Santa’s Workshop for kids, train ride, and family scavenger hunt to keep you entertained all day long. If you’re looking for a full day’s experience, head to Center Bend Farm and enjoy family-friendly fun while you hunt for the perfect tree. They feature a hay maze, wagon rides, and fire pits to keep you warm, as well as free candy canes for the kids. You can also scoop up a handmade wreath to fuel your holiday decorating craze. Greenville’s got a lot going for it, so it’s no surprise this charming city also has some of the best live Christmas trees in the state. Join the family at Mystic Farm, where you can cut your own tree or grab a homemade wreath or other greenery. Their varieties include blue ice, Carolina sapphire, Virginia and white pine, eastern red cedar, Fraser fir, and Leyland cypress. Less than a half hour’s drive from Charleston, Toogoodoo Tree Farm is a family tradition for many. 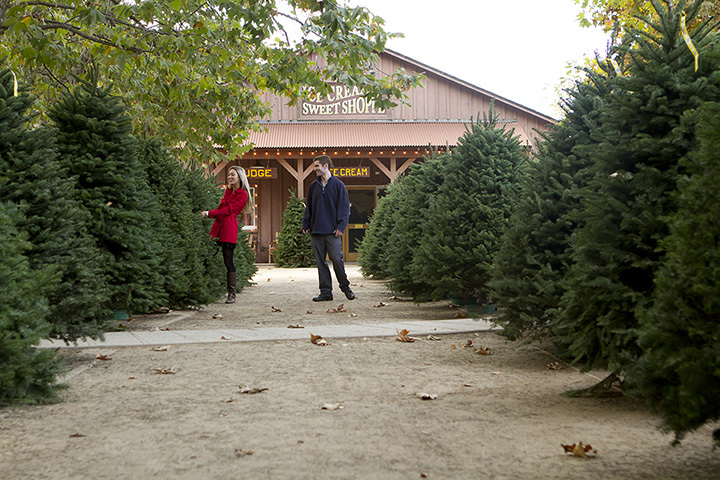 Visitors can always count on high quality trees at good prices (U-cut trees are just $7 per foot). The scenery alone makes a stop here worth your time—make sure you bring your camera for some family photos! Following in the footsteps of tradition, this beautiful Christmas tree farm offers the choose and cut experience for a variety of tree types, including the local fan-favorite Clemson Greenspire. They carefully shear their trees to give them the ideal Christmas tree look, so you get nothing short of perfection. Priced at just $6 a foot, their u-cut trees just can’t be beat! This laid-back, off-beat tree farm might just make you forget you’re at a tree farm. Tucked away from city noise and heavy traffic, this tree farm offers a fun, quiet experience that lets you savor the great outdoors as you hunt for your tree. Grab a cup of hot chocolate before you board the hayride to keep you warm as you walk the fields.